We start with a heartwarming note, which I recently heard about in a New Year’s greeting from Animals Asia, a NGO started by Jill Robinson, originally from the U.K., in Chengdu to rescue Asian bears from their torture-chamber-like cages throughout China’s bear bile farms. On these farms, bears as young as only a few weeks old are caged and subjected to living spaces so small they are often unable to move. Metal tubes are implanted in their stomachs to extract bile to feed a pharmaceutical business that uses the bile to make medicinal and nutritional products. Lately, doctors and scientists say that the bile can be replaced by synthesized compounds and that, more importantly, the bile harvested from live bears can easily be contaminated because the animals are often sick due to their poor living conditions. Animals Asia’s main sanctuary in suburban Chengdu now is home to 378 rescued live bears. Imprisoned throughout their lives, these formerly farm-owned bears were even afraid to touch the grass with their paws when they first arrived at the Animals Asia sanctuary. Bear carers need to bait them out to the grassy grounds with foods such as marshmallows, carrots, tomatoes, and other snacks to kick off their rehabilitation and reintroduction to the wild. The clips below show a newly rescued bear in her cage, and how a sanctuary worker hides tomatoes for the bears’ feeding time. Still, the few hundred rescued bears are a fraction of the tremendous amount of work left to be done. Animals Asia estimates that there are still 10,000 bears in China waiting to be rescued, and another 1,200 in Vietnam. Animals Asia is a marvelous organization that has dedicated itself to ending animal cruelty in a country that has just gotten wealthy enough to become one of the largest pet economies in the world. Their highlights last year also included their campaign to stop the Yulin dog meat festival, along with Hong Kong actress Karen Mok. World Environment also attributes the 11 smog events in China last year to warming temperatures and El Niño, which are responsible for weaker Arctic winds than in previous years. Of course, the biggest driver of pollution is emissions in northern China, with its heavy industry and polluting steel mills, cement plants, and coal-fired power plants. 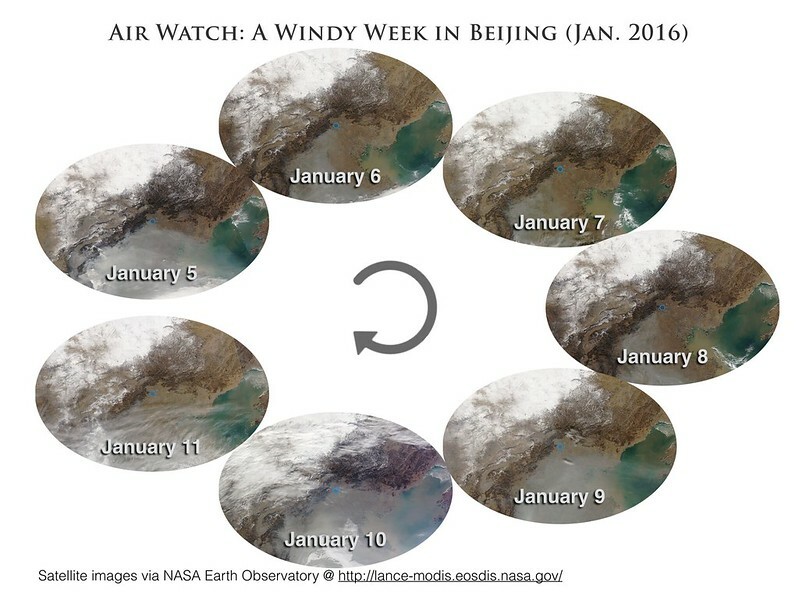 Below see a week’s worth of windy days in Beijing from space and on the ground. The smog-clearing effect of the wind is obvious. Beijing Public Net for Environmental Protection recently launched a series of cartoons on the topic of PM2.5, the tiny deadly particles that make up much of China’s air pollution. It’s a cute attempt to have some fun with the dreaded topic, by giving it the Hollywood treatment. PM2.5 becomes a character named Little P, a contestant to ascend to the throne of “King of Pollution” on a stage that reminds the viewer of The Voice of China, the Chinese version of The Voice. Little P gets all four (pollution) judges to press their big red buttons to turn their chairs (meaning they have voted for him), of course. 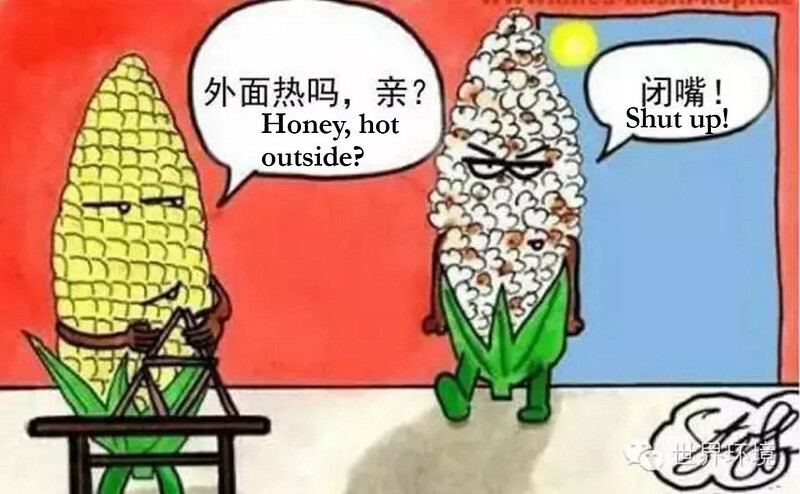 In the WeChat post by the Beijing Public Net for Environmental Protection, Little P made his debut in 1943 when he and his siblings ganged up on Los Angeles, and stayed there for 50 years, giving people eye sores, headaches, and difficulty breathing. In the 1950s, Little P also gave London the nickname “Fog City.” After tours to other countries including Germany and Japan, Little P then set his sights on Beijing, which has become heaven for him and his cousins. The post ends with a propaganda-like note, proclaiming that Little P’s days in Beijing are numbered as Beijingers have awakened and will wage an all-out war on him. The reality is, that war may be a very long one. But here’s a look at how Little P’s most potent enemy, the wind, does its magic to disperse air pollution. 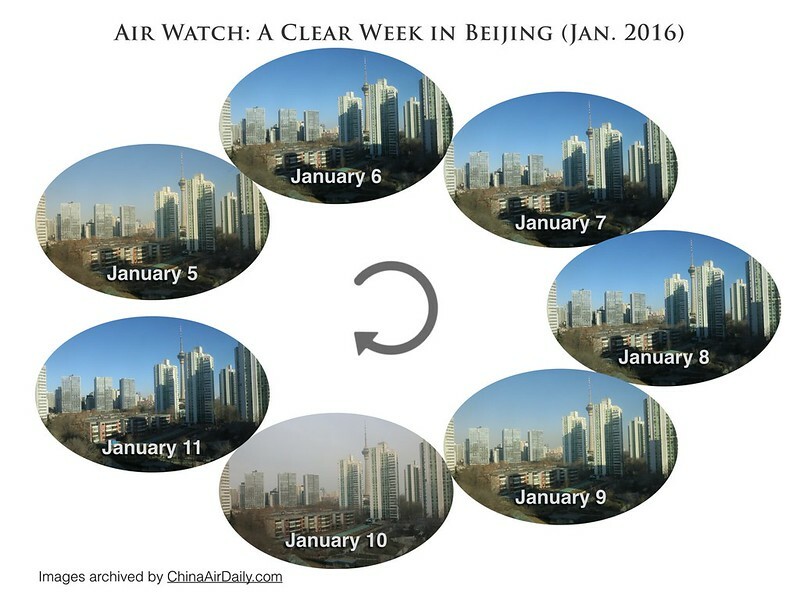 Below are two Vine clips, the first around noon on January 18, 2016 Beijing time, when wind picked up speed to almost 30 km/h, and AQI dropped to around 30. 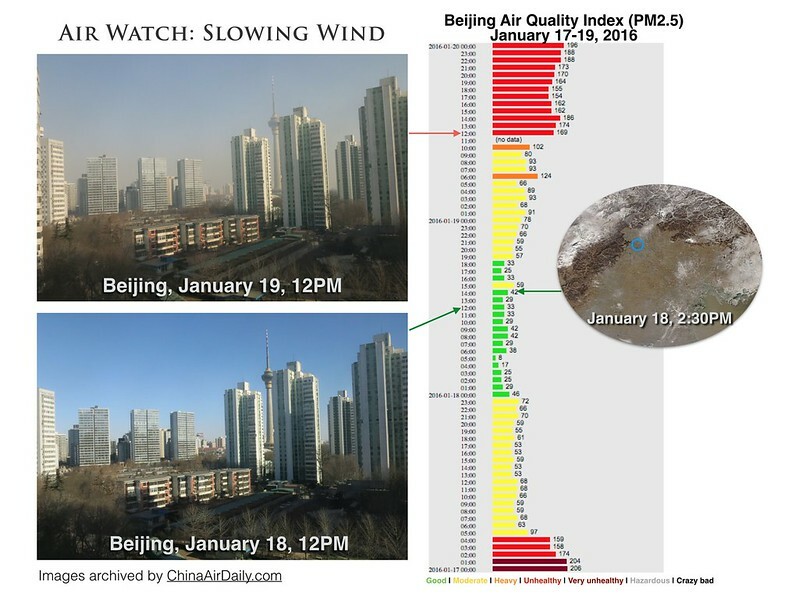 The second Vine clip shows when the wind speed slowed down to 1 km/h around noon on January 19 and AQI at “unhealthy” levels, over 150, although not hazardous. In the photo montage slide at the bottom, you will see the smog slowly building up over the horizon in a matter of 24 hours.